Hydraulic Fracturing Market size was over USD 24 billion in 2015 and is forecast to grow at over 12% CAGR. Increasing crude oil demand from industries including refineries in developing countries will drive global hydraulic fracturing market growth. Rapid urbanization and industrialization are some of the factor responsible for the stimulation of crude demand in the region. Global crude oil demand reached from 95.58 mb/d in 2015 to 96.95 mb/d in 2016. Abundant availability of unconventional reserves including tight oil, shale gas, and coal bed methane will stimulate the hydraulic fracturing market size. In 2015, over 7,500 tcf of ‘unproved technically recoverable’ shale gas reserves were present globally out of which China accounted for over 1,100 tcf of reserves. Growing concern toward depletion of conventional O&G blocks coupled with shifting focus towards development of unconventional resource will boost the hydraulic fracturing market share. The government of China and the U.S. has introduced various initiatives including tax incentives, financial aids and FDI provision in the hydrocarbon sector, which will favor the business growth. High capital cost with adverse environmental effect will hinder the hydraulic fracturing market size growth. Plug and perforation accounted for over 70% of the global hydraulic fracturing market share in 2015. These technologies are widely used for cased hole wells. Its ease of accessibility for fracking in horizontal wells make it favorable technology than others alternatives. Industry revenue generated from sliding sleeves is set to witness moderate growth by 2024 owing to its applications in open hole wells. This technique can be used to shut off flow from one or more reservoir zones that is producing or using too much water. It takes less time as compared to plug and perf during fracking which results lower cost. 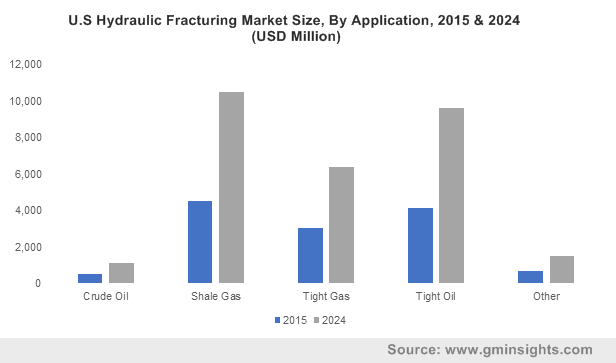 Horizontal hydraulic fracturing market share is set to witness a growth over 13%, owing to its wide applications in extraction of O&G from unconventional reserves. In 2015, approximately 77% of U.S. most productive oil wells were horizontally drilled. These wells are more productive as compared to vertical drilling well as it has potential to access natural gas surrounding the entire portion of horizontal drilled section. Vertical hydraulic fracturing market share is predicted to witness moderate growth subjected to its potential to access the natural gas that immediately surrounds the well end and as result it is less expensive. Hydraulic fracturing market size demand from crude oil was contributed around 14% in 2015 and is expected to witness a substantiate growth from 2016 to 2024. Increasing number of maturity fields and aging brown field are pushing operators to produce crude oil from unconventional resource. The global industry revenue from shale gas is expected to reach over USD 15 billion by 2024. Increasing natural gas demand from power plant industries owing to its better fuel efficiency will favor the industry growth during forecast period. Stringent government regulation to reduce carbon emission will further boost the demand of natural gas in power plant industry. Tight gas is expected to witness a significant growth over 10% from 2016 to 2024. U.S. hydraulic fracturing market size was valued over USD 12 billion in 2015 and is estimated to witness a substantiate growth during the forecast period. Increasing exploration and production of unconventional resources such as shale gas, tight oil coupled with availability of resources such as skilled manpower and advanced technology will favor the industry growth. In 2015, shale oil extraction is accounted for over half of i.e. 50% of U.S. crude oil production. China hydraulic fracturing market share contributed over 45% of regional revenue share in 2015 and is set to witness growth over forecast period owing to abundant availability of unconventional resources. In 2016, it has been estimated that China holds around 1,115 trillion cubic feet of gas which is nearly double of U.S. In 2040, shale gas is anticipated to account over 40% of country’s natural gas production. For Europe, Russia hydraulic fracturing market size contributed over 45% of regional revenue share in 2015. Rising investigation related to development of available hydrocarbon reserve is likely to favor the business growth. In January 2016, Gazprom Neft started examining unconventional reserve at Vyngayakhinskoye field. In 2015, it has been estimated that Russia holds 665–680 tcf of unconventional reserve in Russian subsoil out of which 75% account for hydrates, 7% CBM, 3% account for shale gas and 15% for tight gas. Saudi Arabia hydraulic fracturing market size was valued over USD 100 million in 2015. Rising investment in o & g project are responsible factor to stimulate the business growth. Saudi Aramco is planning to invest USD 334 billion to support infrastructure project, service facilities and in exploration and production phase of unconventional resource. Hydraulic Fracturing market size is consolidated owing to presence of large number of players across value chain. Some of the major participants of this industry are Baker Hughes Incorporated, FTS International, Schlumberger Limited., Weatherford International, Haliburton, Calfrac Well Services, Tacrom Services, Superior Energy Services, Trican Well Services and others. ConocoPhilips, Franklin, Patterson UTI are some of the other industry players. In December 2016, the Patterson UTI entered merger agreement with Oklahoma's Seventy Seven Energy with 201 high specific rigs which will help to expand fracturing business growth. Hydraulic fracturing is a technique used to produce fracture in rock formation that allow flow of oil or natural gas to the surface. Fracture is created by pumping large amount of fluid at high pressure. A fluid consists of water, chemical additives and proppants such as, ceramic pallets, sand that enlarge fractures within rock formation. Sometimes it can occur naturally in certain dikes or vein. In some area, this technique is ban as it has potential to cause an environmental impact, including triggering of earthquake, air or noise pollution, surface, and ground water contamination risk. Ongoing investments towards the development of shale and tight gas reserves is anticipated to drive the hydraulic fracturing market growth.